When Katie contacted me about taking part in a blog hop with Monica Solorio-Snow's yet to be released line, Winterkist, I couldn't have been more excited. Or so I thought until I opened the little bundle that arrived in my mailbox! The colors Katie chose were just perfect for me. At some point before they arrived I decided to make a table runner, and now with the turquoise/aqua colorway it would look festive and match my house! Monica's Winterkist line for Lecien is not my first experience with these adorable little Gnomas, I fell hard for them in her Holiday Happy line too. I fully intended to write a step by step tutorial for a table runner, but then my camera broke. I think I have pictures of the most crucial steps in case you want to make something similar. 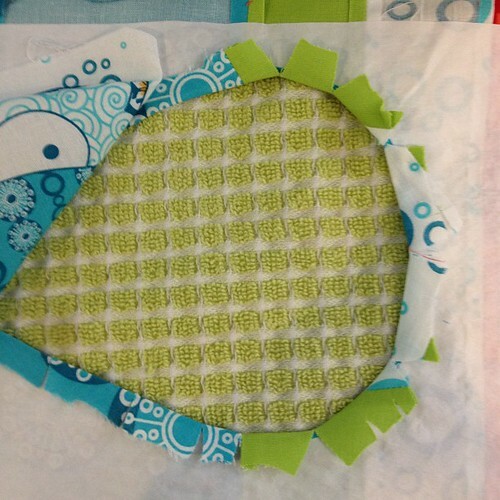 Your first step is to make a strip pieced runner. I cut strips 16" wide and anywhere from 2-5" tall. Piece them together with 1/4" seams and press them open. My runner is symmetrical, but your strips can be put in any order you like. Once your runner is the size you like, take a gnoma for each side and think about where he will look best. Place a piece of freezer paper over the gnoma, shiny side down and trace the outline with a permanent marker. Cut the gnoma out, taking care to keep the reverse shape intact. Iron the negative shape to the underside of the runner where you want the gnoma to peek through. Luckily I did a tutorial on reverse applique here so you can see what to do! I attached the gnoma by leaving the freezer paper intact, pinning the gnoma in place and sewing an invisible stitch to secure the gnoma and then removing the freezer paper. My next step was to baste the table runner front to the batting, but not the backing yet. Then I used embroidery floss to stitch around each gnoma as well as a few lines 1/4" from the seams on the runner. I wanted my runner to be reversible, so I did not want the decorative embroidery stitches to go all the way through. I also couldn't decide on a binding fabric, so I just decided to sew it without one. I placed the front with batting basted (and embroidered) right sides together with the backing, sewed all around the edge, flipped and topstitched 1/8" from the edge. I know this is not as thorough as my usual tutorials, so please don't hesitate to contact me if you need more instruction! 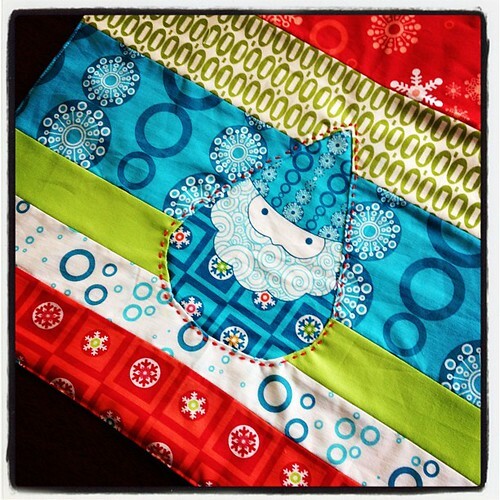 On to the Winterkist Blog Hop details! The schedule for the hop is below. Each Friday Katie will draw a comment from one of the five posts that week (so five chances to win each week!) 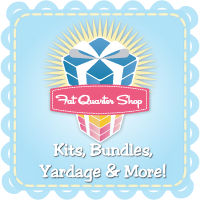 to win a fat quarter bundle from the Fat Quarter Shop! Aug 21 Di at Random Thoughts...do or "di"
I've been seeing sneak peaks pop up on flickr and the projects these bloggers are putting together are amazing! I can't wait to see them all! This is so cute!!! Love those little guys! I love your runner! I want to make one! Thank you for sharing. Darn I hope I wins some fabric ;) Janelle from Emmaline Bags. He is SO cute and I love those colors!! Great job. Even though you didn't have all the pictures you needed, you explained the process very well. It turned out very cute. I like the big stitch around the gnome. Thanks for a chance to win some fabrics. Your table runner turned out so cute! I like your table runner; nice use of the fabric. Thanks for sharing and for a chance to win some fabric. Sweet tablerunner - love the idea of reverse applique (I've never tried it before!!) Thanks for sharing! Great idea for happy Christmas table ! Thanks ! Love the runner - wonderful colors! The santa gnomas are too cute!!! Love it and your reverse applique is great. Thanks. This is a fabulous fabric line! I like your reverse applique addition to the strips. This looks great. I <3 Gnoma Claus! Awesome reverse applique! What a great project! Thanks for the great ideas! Thanks for sharing your runner. Sorry about your camera issues. I'm intrigued with the reverse applique. I've never tried it before but maybe I will. Just lovely!!! The red stitching compliments the gnome really well! great idea! like the reverse applique; it's on my list of technques to try. the red hand stitching adds a bit of pizazz! Great use of the fabric it showcases all the colors and prints so nicely. Great idea to highlight the gnome with embroidery. 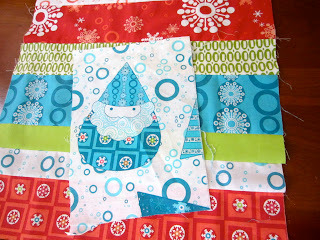 If you went through to the backing you would have an embroidered gnome as part of your quilting. I may try that. Thanks for the inspiration. I love this table runner :) Great idea with the reverse applique! I really like the table runner. I would not have thought to do a reverse applique with the gnoma. And those colors are so me, too! Oh what a great way to show off the gnome from this fabric line. I'm totally in love with the little gnome! This is such a pretty table runner. And I love how you placed the gnoma at the end. He is so cute. Thanks for sharing. This is so pretty - need to learn to do reverse applique of gnomes. Thanks for the post full of fun. awesome, thank's for the tip how to put fabric below! You have TOTALLY inspired me today. I am going to spend my last day of summer break making something like this!! Thank you!! 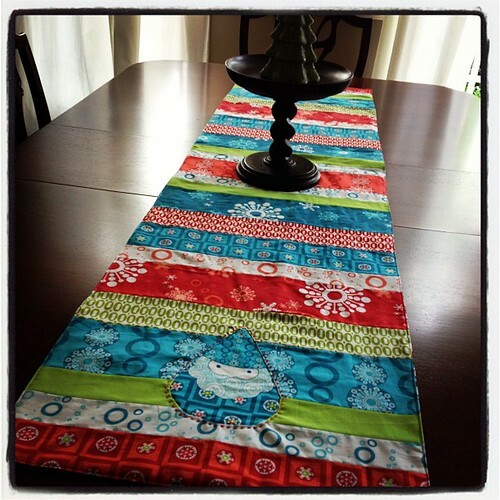 Love the table runner and love Winterkist! Lovely! I like the red embroidery around the gnome. The Gnomas really make me smile. Now winning a fat quarter bundle.. I'd be giggling for a long time coming! HELLO! THIS IS AN ATTRACTIVE RUNNER! This is a really cute table runner. It makes me wish I had a place to put one. Wonderful project!! - Love the appliqued Gnoma. Thanks for sharing! I love it - what did you do on the other side, you said it was reversible - please show! The reverse appliqué is so cute! Very cute. So cute that you should leave it out all year long. I love what you did with the gnome! Great project. I like the hand stitching around the gnoma. Very cute project. I love the fabric. is that terrycloth that you used as the backing? Love the table runner! That Santa gnome is my favorite. To be honest, I didn't think I was going to like it to begin with, but now I am loving it! That technique is great! Thanks for the mini-tutorial! Great table runner! And your Gnoma is so cute (& fierce too!). thanks for the tutorial. Great use of the fabrics... love the color scheme! Super cute and was excited to read about the 'reverse applique' as I've never seen that before! Thank you for the inspiration!! Fabulous! I really like the look of a strip runner. Thanks for the inspiration! I love your sweet little gnoma done in the reverse applique, and the big stitch quilting!! I love your table runner. It's so bright & cheery, and what table couldn't use a gnoma? Love the table runner! 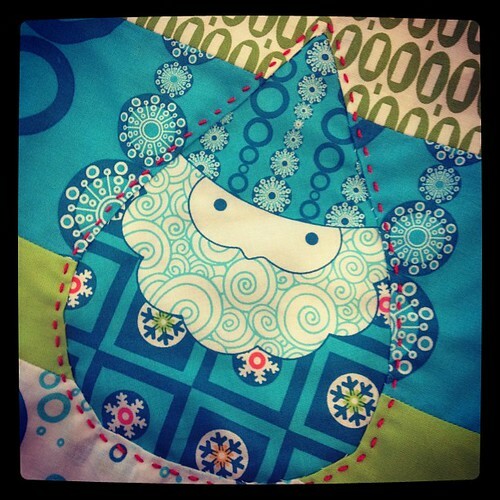 What a great idea with the reverse appliqué for the gnome. Love the reverse applique for the gnoma. Can't wait to get some of the Winterkist fabric!! Wonderful table runner, the colors are amazing. I like how you outline stitched the little gnoma, it really makes him pop. I love the colors when put together that way in your runner...also, it looks great without any binding-good call! Inspiring job putting the colors together. Yours is so different from the rest--almost like a whole different line of fabric. But, then there is that little gnome guy! Great job. Your runner really shows off these Christmas fabrics that I'm drooling over. Love the colors in your table runner. This is such a cheerful table runner! I love the hand stitching around the little gnome - adorable! Your table runner is adorable! I love the gnomes. I love this fabric line! Cute table runner! Love the reverse applique'. Thanks for the giveaway. What a great use of bright Winterkist! Love the handwork around your happy knome. My sister would love this tablerunner! Love the fabric and your table runner! Cute way to use the gnoma. Gnomes Gnomes gnomes... gotta get me some gnomes. Thanks for the chance to win. Cute table runner! That is so cute! I haven't done a table runner before because..well my three cats would destroy it, but the Winterkist would look great as a full size tablecloth too, and I could gnoma to my hearts content! Bright, happy cheerful tablerunner. Love the gnoma applique! Nice project, and I like the look of reversed appliqué with stitches all around. adorable! I love the pearle cotton around it. Love the table runner! It's so bright and happy. And the reverse applique was brilliant. I like the hand work with the embroidery thread - it was a nice touch to add to the gnoma. That runner is so cute! And the gnome is to die for! This is such a great idea. I love this fabric and can't wait to start working with it! Great runner! And how I love that gnome! 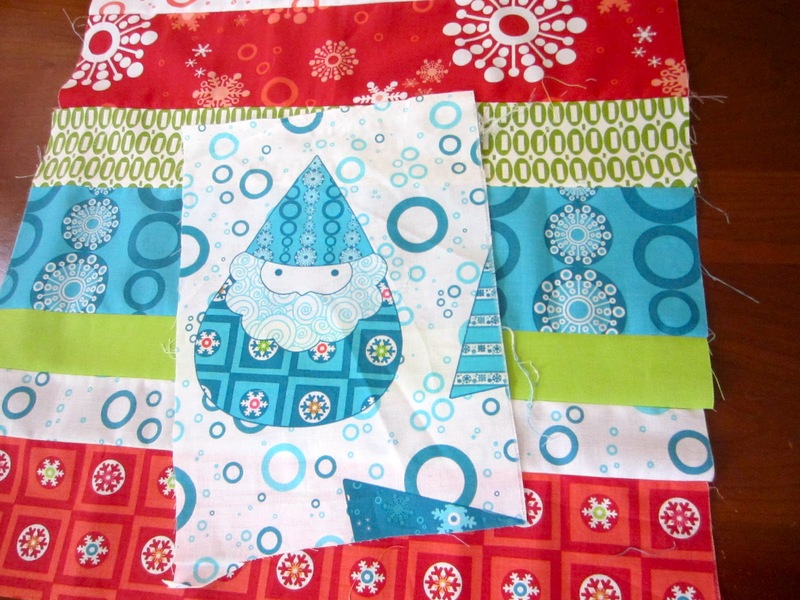 Love the gnomes and the table runner, thanks for sharing and for the giveaway. I love the way you used all the colors in your runner! Thanks for the giveaway. This is gorgeous. I love how you made it and how the gnoma stands out. Thanks for sharing. So cute! Reverse appliqué is something I haven't tried yet. I love the gnomas! Great idea to reverse the applique! Winterkist is such a happy line of fabric! You did a great job on your runner, and I love the gnoma at the end! I hadn't seen how to do reverse applique before, so that was a fun detail I will have to try! Such a cute table runner, and something so fun even a college student could love! Your table runner is adorable! I love the way it looks on ur table too!!!!! I may have to try to make on myself! Thanks! Cute! I'm loving seeing theses little guys pop up every so often.